Since I last rebuilt my development machine I haven’t had a need to even look at web development let alone Windows Azure. 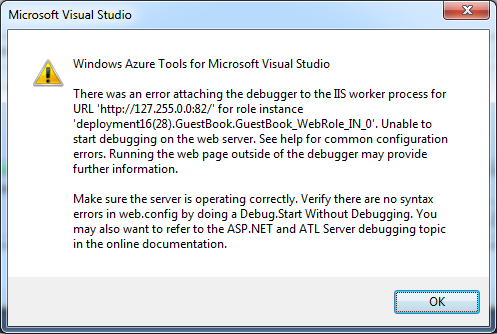 The last time I had “opportunity” to develop anything using Windows Azure was with version 1.3. At the time version 1.4 was still in beta and I couldn’t seem to successfully install it. Lucky me I was added to a project using Windows Azure so I installed version 1.6 along with the Windows Azure Platform Training Kit – November Update and decided to make a quick run through some of the training kit to see how things worked. The first thing that popped out at me was the IP address ‘127.255.0.0’. I immediately proceeded to look at project properties to figure out where this came from to no avail. I then unloaded the projects and looked through the raw project and solution files to no avail. Attempting to ping the address did succeed so I looked through my hosts file in ‘%windir%\System32\drivers\etc’. Nope it wasn’t there either. Searching the Internet (hmmm, I wonder if the term ‘Binging’ will be added to the dictionary?) on the error message gave me a whole lot of nothing. Refining my search to just the IP address sent me off on a tangent for blogs on Windows Azure v1.5 about the need to add entries to the hosts file, although they were helpful in educating me about what in the world the IP address was. For more information on that see http://blogs.msdn.com/b/avkashchauhan/archive/2011/09/16/whats-new-in-windows-azure-sdk-1-5-each-instance-in-any-role-gets-its-own-ip-address-to-match-compute-emulator-close-the-cloud-environment.aspx. Finally *bonk* I got the idea to look in the Windows Event log. It should have been the first place I looked but I guess I hadn’t drank enough coffee yet to think straight. Could not load all ISAPI filters for site ‘DEPLOYMENT16(11).WINDOWSAZUREPROJECT1.GUESTBOOK_WEBROLE_IN_0_WEB’. Therefore site startup aborted. Every time the computer server starts it creates a new application pool with ‘Enable 32-bit applications’ set to false. When the compute server shuts down it removes the application pool so manually resetting this value doesn’t help. Searching around found http://blogs.msdn.com/b/zxue/archive/2011/10/31/enabling-support-for-32-bit-iis-applications-in-windows-azure.aspx. 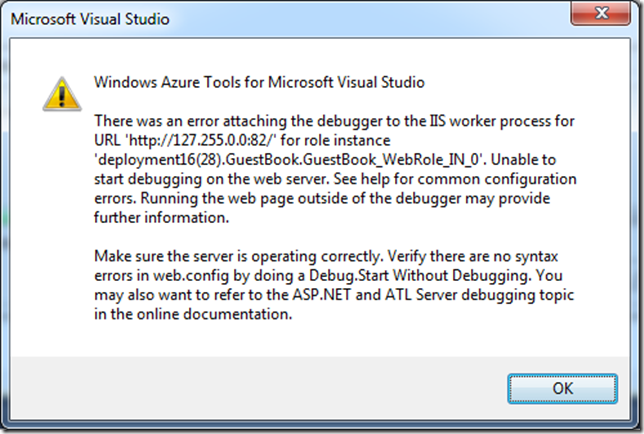 Adding the startup task to set the IIS default to allow 32-bit applications solved my problems. It really only needs to be run once but I just leave it in the project just in case. I am having this same issue, I will add the startup task to set the IIS default to 32 bit applications and let you know if this works! I simply wanted to write a brief word to thank you for all the awesome steps you are giving at this website. My time-consuming internet research has at the end of the day been honored with extremely good details to write about with my companions. I ‘d mention that we website visitors are very much fortunate to dwell in a great community with many lovely professionals with good opinions. I feel pretty fortunate to have seen your webpage and look forward to so many more enjoyable minutes reading here. Thanks once again for everything.